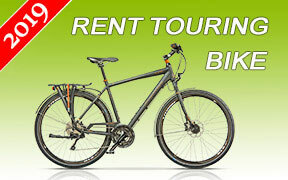 Bicycle rentals St Vlas, bicycle hire St Vlas. The most convenient and cost effective way to RENT A BICYCLE IN ST VLAS, BULGARIA. We offer a wide range of bicycles for rent via Motoroads.com - mountain bikes, city bicycles, touring, racing, city, hybrid, ladies, electric and bicycles for kids. Our St Vlas bicycle rental fleet in Bulgaria is built of reasonably priced new and used bicycles available at low rental rates. All kind of professional bicycle gear, accessories and equipment rental is available upon request in order to make your cycling adventure pleasant and safe. Being long in the cycle hire service, we know what you expect from us, and how to treat you. Bicycle rental in St Vlas. Our rental fleet consists of ON-ROAD, XC [cross-country] or MTB [mountain] bicycles. Booking online a bicycle for rent in St Vlas is quite easy and takes a minute. If you wish we will deliver the bicycles to the place you stay in St Vlas. Renting an on-road, cross-country or MTB bike is probably the best way to experience St Vlas and Bulgaria. Upon bicycle collection, we will give you friendly road and map orientation. ST VLAS - Black Sea resort, Bulgaria » Sveti Vlas (also known as St Vlas) is a beautiful coastal village of approx. 3000 inhabitants, situated just 5 kilometers north of Sunny Beach and 9 kilometers from Nessebar. St Vlas resort is a great combination of beautiful seaside at the foot of the Balkan mountain range. It has been developed into a modern beach destination during the recent years, with brand new hotels and tourist infrastructure (see photos below). This makes it a preferred destination for holidaymakers, who want to enjoy the spectacular views of the mountain while having fun on the beach. The natural conditions- mountain, forest, sea and southern exposure of the mountain slopes, are extremely healthy and appropriate for a full relaxation. The beaches at St Vlas are three with a total length of 1.5 kilometers- the central beach is the longest one, south of it is the small Camping beach and the third one is the beach nearby the new yacht port Marina. Sveti Vlas is also famous for its brand new and beautiful yacht port, which is being developed close to the water base of the local fishermen. Contact us for our bicycle rental services in St Vlas.